- Live video usage on Apple TV, which accounts for 20 percent of channel views, is 50 percent higher than on mobile and desktop combined. 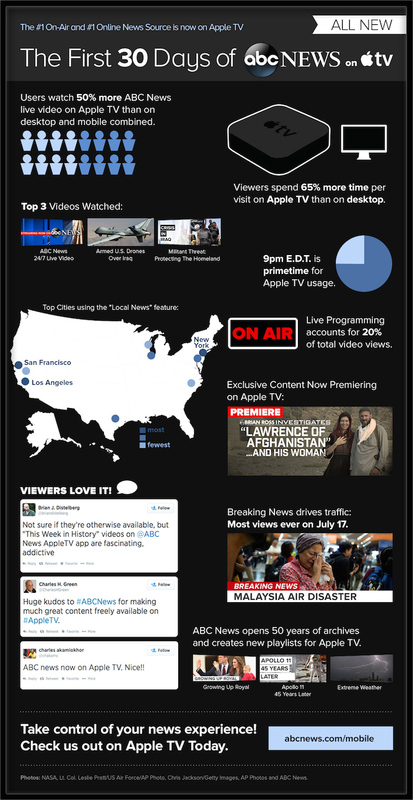 - Apple TV viewers spend 65 percent more time per visit than desktop users. 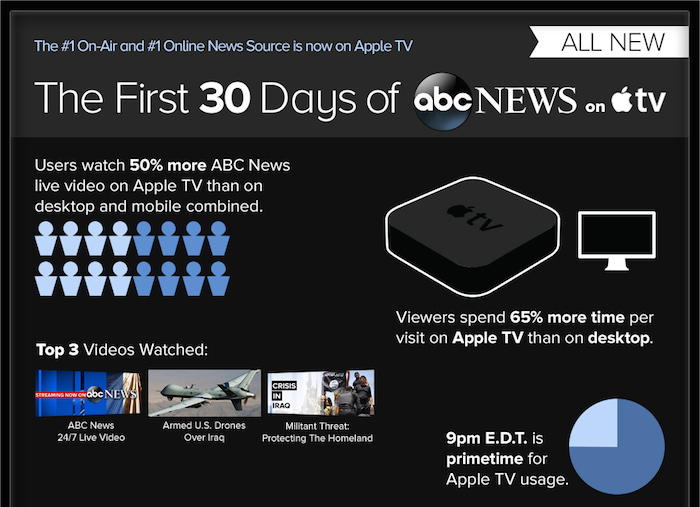 - Peak usage for the ABC News Apple TV channel falls at 9 PM Eastern Time, likely due to that time period encompassing evening viewing hours for most of the United States. Alongside today's usage data release, ABC News is also announcing the addition of three new local stations to the channel: Albuquerque (KOAT), Boston (WCVB), and Honolulu (KITV). The new additions join the original nine local stations made available on the channel at launch. Apple has been adding new channels to the Apple TV at a fairly rapid pace, at least in the United States, although many of them require authentication through an existing cable service provider. The company has long been rumored to be working on a more powerful set-top box, but the latest rumors have suggested the device is unlikely to arrive until 2015. When do we get ESPN Go without needing a cable/satellite subscription? I watch only a handful of channels, but am required to buy multiple tiers on cable or DirecTV to get what I want to watch. On top of the over the air channels, I use ESPN, Velocity, Discovery, CNN, Fox News, MTV, Nick and the Golf Channel. ATv will show it's value when you don't need to already pay for service elsewhere and offer up a per-channel subscription independent of cable/sat. At $ 0.99 per month per channel, you could a-la-carte your viewing and I would suspect that a good percentage of users would be perfectly happy with that. A lot of ATV changes lately. I hope this means a new ATV announcement! Blame the retransmission consent fees of the 1992 Cable TV act. Completely rigged the game in favor of the network affiliates and is one big roadblock for Apple and others reaching deals with cable companies. They're holding things up, looking for money, even though they produce nothing. The thing that boggles my mind is that non-subscription based TV still requires a Cable Provider account. I can understand things like HBO, SHO, etc. But why do local/free networks require it? Thanks for recognising that the situation in the US is not the situation elsewhere in the world. Here in the UK the AppleTV is, let's face it, little more use than an equivalently sized piece of solid plastic. All the main TV channels here (that's all of the BBC, ITV, Channel 4, Channel 5, and Sky channels which adds up to a lot of TV) not only have no end of people watching their material using catch-up internet viewing, but their apps are present on pretty much all the platforms available - apart from AppleTV, that is. How disgraceful is that on Apple's part? What makes it even worse is that they ALL have apps on iOS devices apart from AppleTV, so porting them across to AppleTV would be a trivial matter. Come on Apple, step up to the plate. If you want to be a credible player then you need to deliver on the basics. And not just in the USA but other places as well, particularly where the job would be easy. This is Apple's next big thing and it continues to just sit there in front of all of us. I've got three A TVs and I will be replacing one of them with Apple's next. They all get used at least once a week and the one in the main living room is the primary data source for viewing TV and Movies.